"There's a real focus on the technology stack and companies are spending more and more on that technology stack. And to some extent, they're automating bad processes." "...the technology solutions make it easier to get more bad leads faster to sales than ever before. " "The total obtainable market or the serviceable obtainable market...it doesn't really matter what they call it. The total addressable market is the market that you want to sell to. And a caveat here is that most companies prospect too broadly. " The unsung hero - lead nurturing. You'll have to tune in to hear decades of success handed to you on a platter - making it simple to understand. 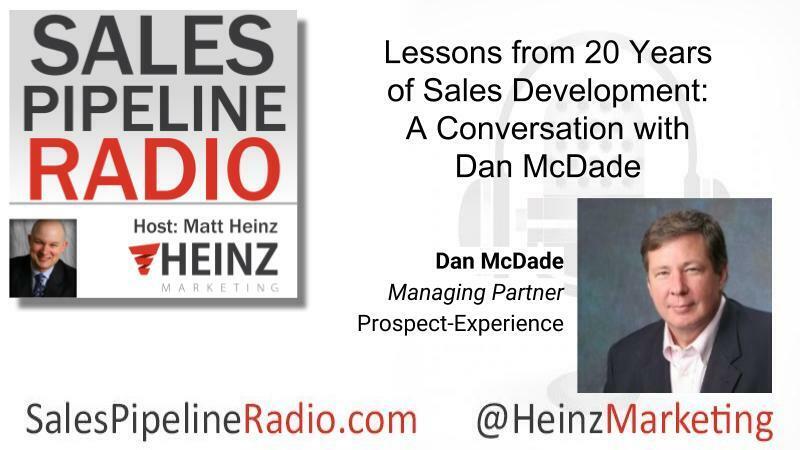 Author, sales guru, and lead generation professional Dan McDade, is our guest from Prospect-Experience and he discusses the over-looked field of prospect experience management. McDade says this failure is needlessly costing companies 10-20% of closed sales every month. McDade has a history of knowledge in the sales lead management and lead generation fields having been the CEO of PointClear for 20 plus years. He is now the managing partners of Prospect-Experience which solves the weaknesses in B2B companies he sought to repair when the leads he created for clients went begging for attention from his clients' sales and marketing people.